I've just discovered I really like making pickles! I usually write up my recipes as I go, to ensure that I don't forget any stages, but I was so engrossed with this from the beginning I almost forgot. 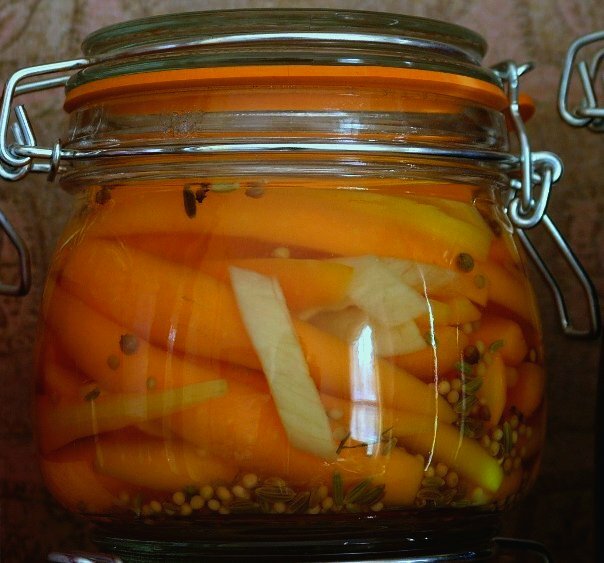 I've been reading blogs all autumn full of ingenious recipes for pickling but I was very unsure about how to create the right balance of flavours - it didn't really dawn on me to taste the spicing vinegar. The original plan was to make 2 completely different types of pickles using different types of vinegar to try out their flavours. As it turned out 1x568ml bottle of distilled vinegar was enough for both the cucumber pickles and the carrot ones, so I just added some additional spice to the carrot, which I made second. I used 2 x 0.5L 'Le Parfait' style jars along with 1 old Bonne Maman jar (this had +20% so a bit bigger than the usual size). Both the carrots and the cucumbers look really good so will make good Christmas presents. I am sure that I will be making more of these in the next couple of weeks. Note: I tasted the dill pickles a week after I made them. They are really good: sweet yet slightly salty crunchy and spicy. If you like things a bit more toned down, you could use 150g sugar and 17g salt. add the vinegar, spices, sugar and salt to the empty saucepan used to blanch the cukes. bring to the boil, and if you can bring yourself to, taste the vinegar to check the balance of sugar and salt. These look so beautiful - I love the combined colours of the carrots and cucumbers. Can I be on your christmas list? Have you tried using natural fermentation for pickling at all. Carrots and ginger work well, although nothing we've tried works as well as sauerkraut. 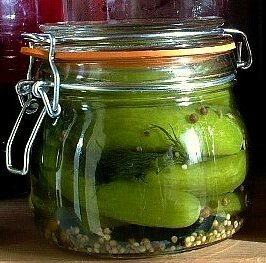 Doesn't look as stunning as your pickles, but they are meant to be especially good for dodgy guts! oh...and when are we all going to have dinner? Choclette - I keep meaning to try lactic fermentation to make sauerkraut but every time I bring cabbage home it gets eaten before I can start. Do you have any tips? Matt - Thank you! Are you posting your pickled pepper recipe, they sound interesting?! I haven't opened the jar and picked a pickled pepper yet. If they taste good I may share the recipe!